Welcome to the online training program. You will learn a variety of valuable skills for coaching the mental game. The underlying concepts and coaching methods to address the seven major mental issues for the junior golfer. The key elements for a pre-shot routine. Download the version of the iBook that works best for you: iBook for mac and iPad, or PDF file for computer and notepads. The entire course consists of 24 chapters and each chapter is a separate HD video. After you view the presentation, you can go directly to the next video chapter. At the bottom of this page you will see quizzes for each chapter. If you want to take the short quiz for the chapter you can do so or just move onto the next video. The final exam consists of questions from these quizzes and requires a passing mark of 80% to receive certification. Provides background information on Dr. Mann, testimonials on this approach to the mental game, and an overview of the course materials. This Chapter address the personal qualities and values that will help you create and sustain a successful career as a coach for the mental game. Provides an overview of the core issues that will be addressed during the entire training program. Discusses how to establish and structure the relationship with parents and the young golfer in the beginning of the relationship. Intake documents and legal concerns are discussed. This is a great chapter about the real business of coaching the mental game. Discusses the various areas for assessment in coaching the mental game. This chapter looks at social factors, academic performance, family dynamics, diet, exercise, and assessing inner life of thoughts and emotions. Discusses the GolfPsych test which measures traits that have been shown to relate to championship play in tournaments on the PGA, LPGA, and Champions Tour. 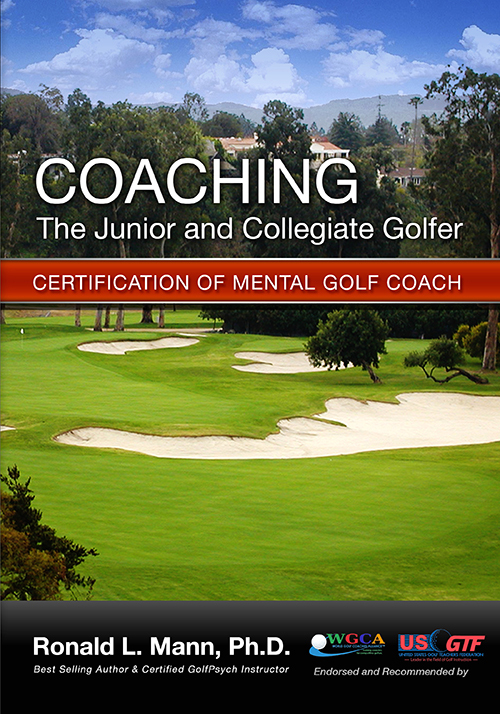 Gives an overview of the specific tools needed to coach the junior and collegiate golfer. These are the core methods that will be used throughout this training program. Discusses the process of meditation as it applies to mental training for the junior and collegiate golfer. This chapter addresses how it works, the benefits for health and enhanced golf performance, and the actual techniques used in meditation. Discusses a key breathing technique to manage emotions and the mind. Provides instruction on how to use self-hypnosis and deep relaxation to program the subconscious mind with positive self-talk and images for enhanced golf performance. A 15-minute audio program is included in this chapter for direct instruction. Teaches a process to facilitate changes in a student’s inner life in order to create mental strength, higher self-esteem, and a positive, never-give-up attitude. Discusses the process of visualization and how to use for mental coaching. Various types of visualization are discussed as well its importance as part of the pre-shot routine. Explores the technique of muscle testing. Discusses the use of affirmations in programming the subconscious mind for a strong mental game. 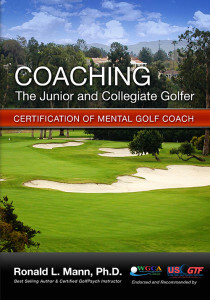 Discusses two research studies on thought and relates the finding to the mental game of golf. Discusses one of the most essential aspects for the mental game: the pre-shot routine. Discusses one of the seven key issues for Junior and Collegiate Golfers: Realistic Expectations. Discusses methods to enhance focus and concentration. Discusses two of the seven important issues for junior and collegiate golfers. Discusses the important the methods for enhancing a positive self belief and positive attitude about life. This issue also relates to one of the Eight Traits of Champions. Is a short chapter on the importance of having a core identity that goes beyond golf. It is important to have a balance life. Discusses one of the seven key issues facing junior and collegiate golfers. Discusses what you need to do when deal with a difficult student/player. He/she may have a lot of talent and a lot of potential, but their personal issues are creating a problem for them and the team. Discusses what you can do to create a strong, winning team. There is a special guest presentation on creating ownership by Coach Joe Taylor. A number of digital downloads are included in this program. You can download the various books, documents, and audio programs in Chapter 1. I hope you have fun with the course. Please contact me at mannr@ronmann.com if you have any questions along the way. By purchasing this course, I agree to the terms and conditions and acknowledge that I have read and understand the information.